Over the past few years, bicycles have become an increasingly popular choice among urban dwellers. Indeed, in certain areas and commuter routes in New York City, bikes outnumber cars. And it’s easy to see why. Eco-friendly, good for your health, practical, and affordable, to name just a few benefits. E-bikes also provide an easy way to travel longer distances faster. With electric assistance, a previously daunting hill becomes a piece of cake. Add luggage hauling features, and you have the ultimate functional bike. Versatile, family-friendly, and convenient, a cargo e-bike will take you to the store, on a school run, or to a camping site with ease. Here are the best electric cargo bikes that set a new standard in the cycling industry thanks to their innovative designs. We’re starting this best electric cargo bikes list in style. The Load 75 bike from Riese & Müller blends innovation and function with a sleek design. Compared to the company’s previous model, the bike has grown 6% in length to provide 50% more cargo space. Protected and safe, the cargo area is perfect for children, groceries, or luggage for a camping trip. The Load 75 e-bike features an adjustable stem and seat, a Bosch drive system that also comes with the DualBattery Technology for extra range, and a reliable locking system. Riese & Müller offers this family-friendly e-bike in various configurations, to suit any preference. The MK1-E cargo e-bike from Butchers & Bicycles is compact but spacious. A modern take on the original tilting cargo bike, this bicycle comes with a front box that allows customization. The user can easily change the interior according to different needs. From taking two kids to school to attaching a special car seat for a toddler, or using the removable lid feature to transport cargo, this bike can do everything. MK1-E comes with the powerful Bosch Performance CX motor, single or dual batteries, a box with a window version, and two gear options. Available in timeless Black and White. We’ve added the HNF-NICOLAI CD1 bike to our best electric cargo bikes list not only because it’s practical and versatile, but also because it features impressive craftsmanship and superior stability. Designed to offer an eco-friendly alternative to a car, this cargo e-bike has an innovative tilting technology that provides optimal stability in traffic, even when fully loaded. The bike has a luggage capacity of over 260 lbs, a Bosch CX motor, a Bosch Purion display, Supernova E3 lighting, and various accessories. CD1 is also available with two wheelbases and cargo bed lengths. Appropriately named, the Family bike from Urban Arrow maximizes safety and comfort for the little ones while providing a convenient alternative to a family car. The children’s seating has a lowered position for optimal road adherence, while the adjustable three-point belt and the tough expanded polypropylene box enhance safety. The brand offers different motor and battery options, along with a set of accessories that include an extra bench and a rain cover. Optimized design at its finest, the Tern GSD bike has the length of a standard bike but can carry luggage of up to 400 lbs. This is certainly one of the best electric cargo bikes you can buy. Apart from the cargo capacity that makes carrying two kids as easy as possible, this bike also features a folding design. The user can pack the GSD down to a 1/3rd of its volume in under 10 seconds, making it easy to fit the bike in compact apartment, elevator, or train. Panniers and luggage racks enhance the functionality of this folding cargo bike further. Our list of best electric cargo bikes also includes award-winners. Spicy Curry from Yuba Bikes is one of them. A hot and fresh design, this cargo e-bike also impresses with its range of functional features. While it weighs 60 lbs, Spicy Curry can haul up to 300 lbs in cargo. The bike has a lightweight but sturdy aluminum frame, a Bosch Performance Line CX Motor with a PowerPack 400 battery that offers a range of 30-60 miles, and a Yuba Add-On cargo system that fits from one to three children. Optional accessories include monkey bars, cargo bags, and bamboo side boards. The Bullitt XT e8000 Shimano StePs is a high performance and high range cargo bike. Not only does the bike feature premium components, but it also looks cool while helping you haul kids or groceries around the city. Apart from the high-quality Bullit frame, the e-bike also comes with Shimano XT transmission and shifter, the Shimano STePs e8000 motor, and US-made Thomson handlebars, seatpost, and stem. The front loader cargo e-bike comes in bright colors such as blue, red or yellow, based on availability. The XCYC Pickup Allround cargo bike is as versatile as they come, so we had to include it on our best electric cargo bikes selection. Made with three wheels, this e-bike suits a wide range of riders, including those who may not feel comfortable on a classic bike. A perfect choice for grocery shopping or family outings, the bike has a spacious cargo area at the back. Apart from the total capacity of 550 lbs, the cargo bicycle also features a Bosch Performance Line CX system, Shimano 9-gear shift, hydraulic disc brakes, Bosch Power Pack 500 Wh battery, and a handy Bosch Intuvia display. At a glance, the RadWagon looks modern, practical, and – yes – rad, but the standard size and cool urban design hide more under the surface. Designed with function in mind, this e-bike has a total payload capacity of 350 lbs. The integrated rear rack is spacious enough, but RadWagon also offers the opportunity to add panniers, baskets, and platforms to expand luggage space. Made with a 750W 48V power system and 48V 14Ah (672Wh) batteries, the bike provides assistance for 25-45 miles. The twist grip throttle offers 750W of power on demand. Regenerative braking, an LED headlight, and 2.3″ wide tires are just a few of the bike’s features. The Sanitov movE has a generously sized box which makes it ideal as a family hauling bike. Of course, nothing stops you from also setting up a ‘business on wheels’ company in-between taking the kids to school and going to family picnics. That’s how practical this cargo e-bike really is. Made of aluminum, the rear cargo box has an integrated lockable compartment that contains the battery and also offers space for smaller items. The electric motor system with a 36V, 15,6Ah, provides a range of 25Kmh to 30-50K, depending on conditions and bike configuration. Leather grips and saddle along with wooden surfaces add an extra-special touch to the design. The Bunch Family Cargo Bike aims to maximize quality time between parents and their kids. Featuring a large front cargo box at the front, this bike can easily haul four children of up to 220 lbs. The best electric cargo bikes should be as functional as possible and this Bunch model is no exception. It comes with a step-through frame, a lockable compartment, puncture-resistant tires, and a powerful 500w 48v DAPU Hub Motor. The bike is perfect for riders of 5’2” and up to 6’5”, which suits most parents. On top of all of these features, the Bunch Family Cargo Bike also comes with a micro-USB port that can charge your smartphone while riding. If you’re looking for something that can show off your passion for modern design while helping you haul your stuff, you can’t go wrong with the Chike e-Cargo bike. Minimalist and simply cool, this bike has a distinctive silhouette that will turn heads on the street. The aluminum frame boasts a powder-coated finish, with both versatile black and vibrant colors available. The large platform at the front features rails for straps to allow the user to easily secure the cargo. Depending on the user’s needs, the platform is easy to extend. Other features include the Shimano STEPS E6000 e-bike system, 418 Wh Li-Ion battery, Shimano Alfine Di2 8-speed hub gear, as well as hydraulic disc brakes. The CarGoAway bike from Ti Cycles doesn’t just have an inspired name, but it also offers the perfect alternative to a four-wheel ride. Custom made and built to order, each bike comes with a range of practical features to make hauling tiny people or large bags as convenient and fun as possible. 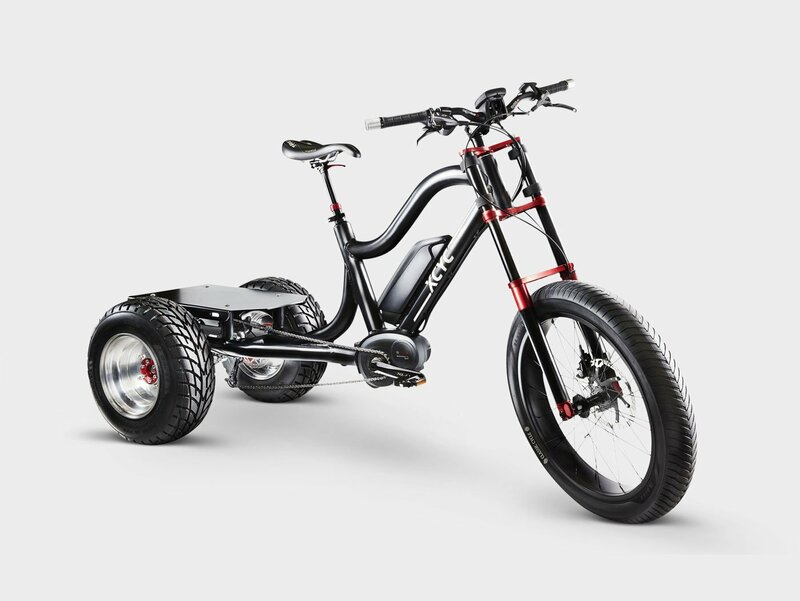 The bike is available in various sizes and configurations, providing a loading capacity of up to 300 lbs, a clean belt drive, solar battery charging systems, as well as front and rear cargo space. As a bonus and quality assurance, each bike is hand built in Portland, Oregon, USA. Danish brand Christiania Bikes has been making bicycles since 1978 and cargo bikes since 1984. Safe to say, the company has plenty of experience in the industry and has even won a prestigious Danish Design Award. Model S showcases the brand’s specialized technology and innovative design. While specifically designed for transporting children with special needs as it comes with a special ramp that allows wheelchairs to ride up the box, the cargo e-bike also suits other uses. It provides a convenient way to load heavier equipment or luggage with a total capacity of over 550 lbs. This three-wheeled bike comes with a safety belt, a custom designed hub for heavy front loads, and other bespoke components. Our list of best electric cargo bikes ends on a high note with UP30e from Douze-Cycles. Extra quiet and powerful, this electric cargo bicycle comes with a Brose Drive S motor with 90Nm of torque and a Li-ion Graphene battery that uses new technology to provide more energy capacity. Thanks to the modular equipment design, the user can install a soft bag or aluminum boxes in the front loading cargo area. Other features include four levels of assistance, a micro USB charging port, Brooks leather saddles, Supernova lighting, a Gates Carbon Drive belt option, and a choice of transmissions.